The ‘Maximising the Value of Apprenticeships to Wales’ report is an independent report undertaken by Beyond Standards, on behalf of the City & Guilds and the NTfW, who in turn were supported by the City & Guilds National Advisory Committee for Wales. We commissioned this independent report from Beyond Standards. Their conclusions and recommendations are their own, based on interviews with a strong sample of employers, apprenticeship providers, government agencies and desk research of recent published reports. They do not necessarily match today’s policies in our organisations. 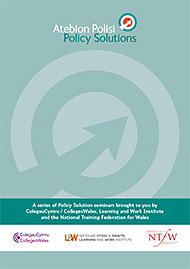 This report offers fresh ideas and a new momentum to the debate about how Wales might provide an exemplary apprenticeships system. Some practical means to achieve this goal are suggested in this report, with clear recommendations. Separate to this report from Beyond Standards, we have published our own response and reflections which include a number of calls for action from the Welsh Government. The report and the accompanying response document were launched at the Senedd on Tuesday 19 January 2019. A comparison of Wales-level data with UK-wide data on apprenticeships, including completion rates.